The pre-credits scene of episode eight of The Walking Dead, “Nebraska,” picks up at the previous episode’s conclusion. Ex-sheriff’s deputy Rick Grimes (Andrew Lincoln) lowers his gun after shooting the young Sophia (Madison Lintz) -who, unbeknownst to the survivors – was a walker and locked up in Hershel’s (Scott Wilson) barn with the other undead. 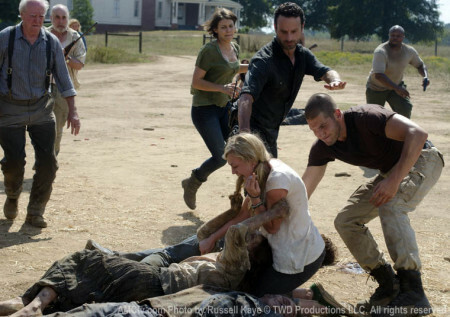 As Carol (Melissa McBride) sobs over her daughter, the survivors stare in shock at the girl’s crumpled body. Shane Walsh (Jon Bernthal) – who busted open the barn door to free the walkers – is initially speechless but snaps out of it, boiling inside. Shane vents his anger on Hershel, who he blames for knowing about Sophia but staying silent about it, which in turn a) prolonged the survivors’ stay on the farm, and b) caused them to go on needless, dangerous searches, such as the ones that almost got Daryl Dixon (Norman Reedus), Shane, and Andrea (Laurie Holden) killed. 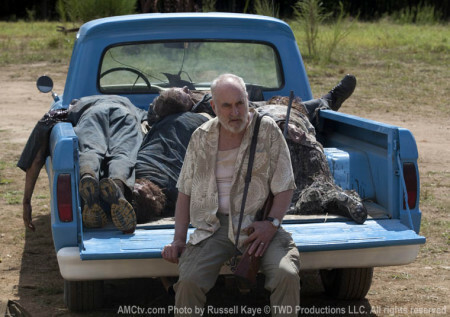 Hershel denies the allegations and evicts the survivors. Post-credits, it turns out that Shane isn’t alone in his suspicions: Glen (Steven Yuen) confronts Hershel’s daughter Maggie (Lauren Cohan), who responds with fumbling half-answers; Glen leaves it as it is. Daryl tries to comfort the silent and grieving Carol. The survivors agree to dig graves for Sophia and Hershel’s wife and stepson, and burn the rest, a herculean task. As everyone gets to work, grumbling over this disgusting job (body parts keep falling off the terminated walkers), Rick broods over his failure to protect the girl. Dale (Jeffrey DeMunn) coldly eyeballs Shane with a knowing stare, causing Shane to explode and launch into an angry rant comparing each one’s contribution to the group. Hershel presides over the funeral service, and takes it seriously, dressing in a suit and a tie, but not without staring longingly at his flask. Noticeably absent from the service is Carol, telling Lori Grimes (Sarah Wayne Callies) that the thing in the barn wasn’t her daughter but a different creature.